Wrap hook with thread. Tie in a sparse tail. Dub the body, thin at the tail and large at the head. Whip finish. 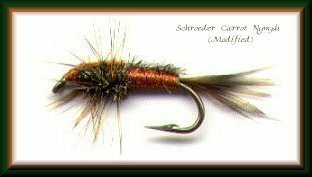 This is a very easy fly, but works fantastic in lakes. We're talking landing the BIG ones! 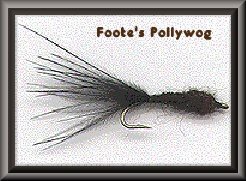 Tied it after seeing pollywogs in an Oregon lake. Its worked great on every lake since. Fish it slow. De-barb the hook and slide bead on. Wrap hook with thread. Tie in a tail of mallard flank, consisting of 6-8 barbules. Tie in wire, then peacock herl. Wrap peacock herl forward, and tie off temporarily, about 2/3 of the way up. Tie in some mallard flank to create emerging wings. Continue wrapping peacock herl forward, up to the bead. Tie off. Wrap wire forward and tie off behind the bead. Whip finish. Wrap hook with thread. Tie in the tail and tie off. Tie in ribbing. Tie in peacock herl, keeping it on top of the hook shank. Tie in Antron yarn and bring thread forward, about 3/4 the way up the shank. Wrap Antron forward, creating the body. Tie off, but do not trim off excess material. Pull the peacock herl forward, keeping it on top of the hook shank, and tie off at the same point as the body. Wrap ribbing forward, making three or four turns and tie off at the same point. Pull Antron yarn back, separating the two strands of peacock herl and tie off 1/8 inch back toward the hook bend. 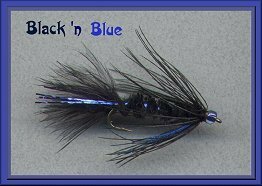 Tie in hackle. Pull the two strands of peacock herl back to the tie in point and tie off. Bring thread forward, leaving enough room to tie off the materials. Wrap peacock herl forward, tie off and trim. 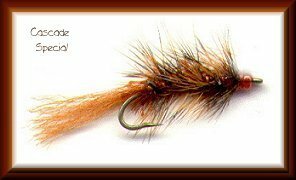 Wrap two turns of hackle, tie off and trim. Pull the Antron forward to create wing case, tie off and trim. Whip finish. Wrap hook with thread. Tie in the tail, the length of the hook shank, and tie off. Tie in two strands of Angel hair on each side of the tail. Trim to length. 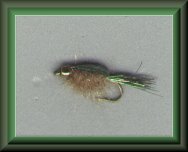 Tie in hackle, then sparkle chenille. Wrap chenille forward, up to the bead, and tie off. 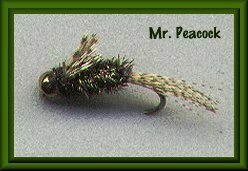 Wrap hackle forward, up to the bead, and tie off. Whip finish. Step 1:	Wrap hook with thread. Step 2:	Tie in a sparse tail. Step 3:	Dub the body, thin at the tail and large at the head.